Replace your electrice toothbrush head without replacing the entire toothbrush. This device is compatible with many brands. 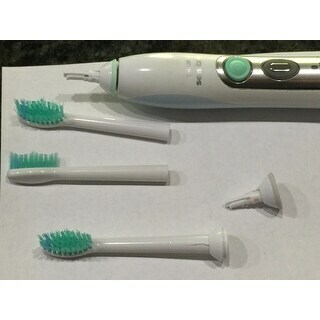 Electric Toothbrush Rechargeable Heads P-HX-6014 Replacement for Phillips Sonicare. These are just generic replacements which fit the Sonicare, but are not Sonicare. SMH While I bought them for a good price. The fact is, they were misrepresented. I am pleased with the replacement heads. The description said, replacement heads “compatible” with Sonicare toothbrushes. I assumed they were an aftermarket product. They did fit my Sonicare toothbrush. At the price I feel like I can change the head much more often! Fit my Phillips Sonicare electric toothbrush great. Very happy with the brushes and the price! Different colors but all the same. Great buy! Quality long-lasting soft bristles. I've tried other compatible brush heads before, but they were always tight and hard to install or remove. This is truly the best set of compatible toothbrush heads I've found to fit my Philips Sonicare toothbrush. What a bargain. I have a Sonicare electric toothbrush that I have had for years. I always cringed when I had to buy replacement toothbrush heads; but when I found these at such a terrific price, I jumped at it. They are just as good as the name brand at a fraction of the cost. These are NOT Sonicare replacement heads and I resent the advertising which looks and leads one to think they are. Wasted my $$ on these cheap substitutes. These Sonicare Replacement Toothbrush Heads are economical, fit my Philips Sonicare Toothbrush handle perfectly. The price comparison between the Brand Name and these replacements is astronomical.... I'm all about finding the bargains &amp; This is it! I can't tell the difference between these &amp; brand when I'm brushing &amp; my teeth feel so clean, afterwards. Do not be fooled with this compatible product if you have a Sonicare toothbrush, these will slip out of the toothbrush while brushing, I stopped using them and still have some left because they do not work well with my Sonicare. Could not find this item cheaper anywhere else. It fits my sons replacement sonicare toothbrush. I would definitely recommend this product. The brush heads are smaller than the actual brushes from the store. 2 weeks after using my first brush head the metal part comes out of the bottom. Regrets on this purchase. The heads are not as pictured. This is VERY misleading, The heads are for rotating brushes. When the items arrived there wasn't any packing invoice to contract the company. They worked just fine but they have hard bristles. If you prefer a soft or medium bristle brush don't buy these. Only price is good other then that they are so soft. I stopped using after first round and will never buy them again. The toothbrush head & band do not fit each other, though the brush head fits the toothbrush itself. A heck of a deal! But they are NOT sonicare brand. Just FYI. Do not purchase this toothbrush head its come apart between the toothbrush head base and the body of the toothbrush head. Also crack on the body of toothbrush head after only couple time of used. Great economic choice and works well. Did not fit my sonic toothbrush but they were exactly like the photo. I really wanted to like these. They didn't fit snug like the name brand brushes but used them anyway. Toothbrush eventually quit working but they did the job while they lasted. Fits fine but the bristles are to soft, need to be a medium stiffness. These are comparable to the brushes from Sonicare. I highly recommend them. The price is a fraction of the price with great quality! 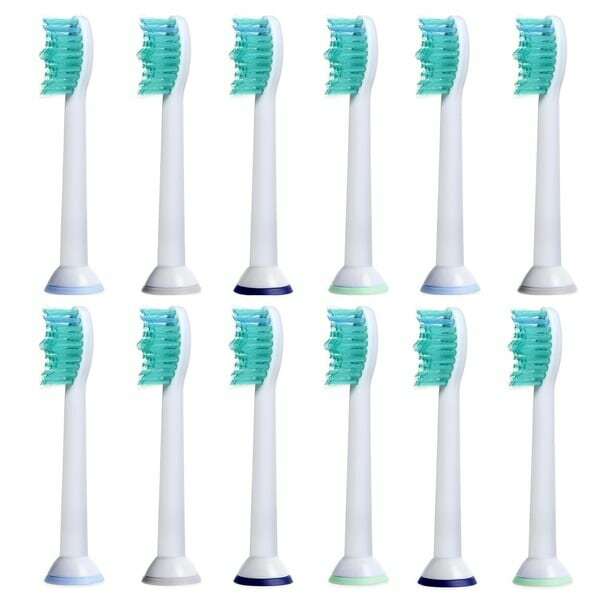 I love my Sonicare brushes and will only purchase online with overstock. Very nice and durable. Change our toothbrush heads about every three months so it is quite nice to be able to purchase in volume. Such a good value. "Do you find these slip off the base as one reviewer said? Do they make a lot of noise? We bought generic brand before and they were LOUD!" I do NOT find these slip off the bases easily and don’t find them any noisier than the originals they replaced. They don't slip off the base, and they are not loud. "Do you know if this fits the Vioslim VSS150?" "Does it work on hx5310?" "Do they fit diamond clean"
I'm not sure. I don't have one. Sorry. I already have the toothbrush for these heads and this is a very good deal on the replacement brushes!